My Dog’s Got Fleas is a fun, fast-paced story about a dog and a child who go to the vet to find that the dog has fleas. What kind of fleas might there be and where will they go when they’re gone? The first comment from Alex was that she was glad that Dweck didn’t decide to kill the fleas as kids reading the book might be slightly traumatized after building a relationship with the flea characters. Alex and I agree that this is our favorite book so far from the very talented Julia Dweck. Each flea has a unique character. Gleeflea is the leader of the Flea Glee Club; Successflea has worked his way to the top, and Hopeflea lives in a world of rainbows. My favorite flea was Wonderflea who flies around in a long cape saving the day while Alex preferred the villainous flea and found his expression to perfectly convey the evil intent of the character. The illustrations are fun and bright and give perfect personality to the characters written. A special surprise ending awaits observant children and Alex has an especially soft spot for dog stories and absolutely loved My Dog’s Got Fleas. While we enjoyed the illustrations we were especially delighted to find that the illustrator had based the dog on his own pet. Another great story from Julia Dweck. My Dog’s Got Fleas can be enjoyed by all ages but would especially be fun for preschool children. 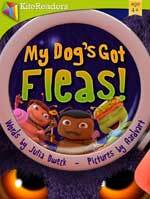 My Dog’s Got Fleas is a must for any school or public library. Check out further reviews of Julia Dweck’s books Cat or Dog for President, Brianna the Ballet Fairy and Caarina the Cooking Fairy. For more information about Julia Dweck and her work, visit her website. You can connect with her on Goodreads, Facebook and Twitter @juleloves2write.